The Internal Revenue Service is considering modifications to energy investment tax credit regulations, which could have implications for energy storage and other technologies. The IRS and the U.S. Department of Treasury issued a notice last Friday that the agencies are seeking public comments on Section 48 of the Internal Revenue Code, the commercial Investment Tax Credit, concerning the definition of qualifying energy property. The ITC generally provides a 30 percent tax credit for investments in energy projects. Regulations that govern the ITC haven't been updated since 1987, however, so there's been growing confusion around which technologies qualify and how they must do so. The IRS and Treasury wrote last week that they "anticipate" issuing new tax credit regulations. In 2005, Congress passed legislation increasing the ITC from 10 percent to 30 percent, and allowed additional technologies to qualify for the credit under Section 48. However, the IRS has not issued new guidance for energy technologies in decades. The motivation to update the rules stems from the rapid evolution of the energy industry in recent years, said Gary Hecimovich, Deloitte’s lead partner on energy credits. The confluence of the tax credit increase in 2005, renewable energy standards being passed at the state level, and a precipitous drop in technology costs, especially for solar, brought the ITC to the fore as a financing vehicle to build out distributed generation. “You had an area of expansion in the law, and you didn’t have guidance under the old regulations to help taxpayers and developers and financiers to determine with a great deal of confidence what qualifies for the credit and what doesn’t qualify for the credit,” said Hecimovich. Additional questions have arisen since 2009, when the Recovery Act came into effect and created the 1603 cash grant program that could be used in lieu of tax credits. The 1603 Program, which has since expired, followed the same regulatory guidance as the ITC. According to Hecimovich, taxpayers would have frequent exchanges with the IRS to try to understand the program and how decisions made on 1603 relate to the ITC. There has also been litigation. 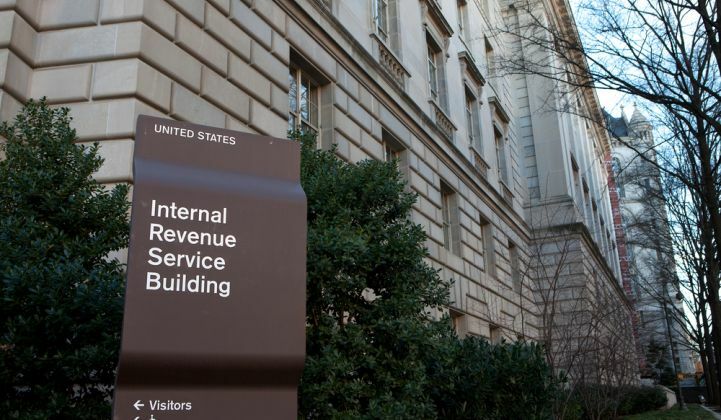 In one case, a project developer sued the IRS over its guidance on dual-use property. The plaintiff, W.E. Partners, built a cogeneration plant next door to a chicken processing plant. The cogen facility produced electricity and steam for the chicken company. The developer filed for a 30 percent 1603 grant and was ultimately offered a much smaller credit because a portion of the grant would be serving the sale of steam, in addition to electricity. W.E. Partners sued to receive the full credit and lost. While the 1603 Program has expired, issues that have cropped up under the program are still relevant today because the same rules apply to the ITC. Guidance on how to treat dual-use property is not clear under the old 1987 regulations, said Hecimovich. There is also uncertainty around energy storage, which is only addressed in existing regulations as thermal-based storage, when today there are a variety of applications for storage, such as demand response and backup power. It’s also unclear how much of a storage project qualifies for an incentive, since the tax credit is only relevant for the portion of the storage device that’s used to manage renewable energy. According to Deloitte, businesses have asked the IRS for several private letter rulings on energy storage over the last four years. The IRS is now accepting public comments on dual-use property and energy storage, among other items, through February 16, 2016. With the ITC currently scheduled to step down from 30 percent to 10 percent at the end of 2016, the timing seems a bit strange. However, there’s a reasonable chance that Congress will extend the ITC at a higher level. And even if there isn’t an extension, there will continue to be confusion around the tax code at the 10 percent level that will need to be addressed. In theory, Congress could pass a comprehensive tax reform package that would address all of these issues, but in reality that process is likely to take years, said Hecimovich. Given the level of uncertainty in an area where the government is spending billions, “It’s a big economic issue for the industry to gain comfort,” he said. As of August 2015, $24.5 billion had been issued for renewable energy projects under the 1603 program alone. “I don’t think people in the federal government would be pursuing this unless there was a real need for it,” said Hecimovich.